World’s Talles Man just got married reported by Reuters (Beijing) after a long search for a bride all over the world. 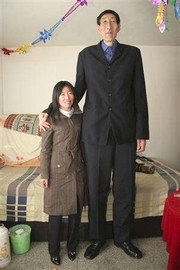 Bao Xishun, 56 years old who is hailed tallest living man by Guinness Word Records with a stunning height of 7’9″ (i only asked for 5’11”) got married to a 29 year old saleswoman from Inner Mongolia who is only 5’6″. yikes. that sounds creepy dude. and 56 is too..err..late for marriage? hehe. he must have had a hard time looking for the perfect bride. hihi. hah. almost half ang age at height. if thats my height?it would be difficult for me to find a wife.unless if i am a billionaire.girls wont hesitate marrying a giant for billions.lets be practical.admit it.liars go to hell.